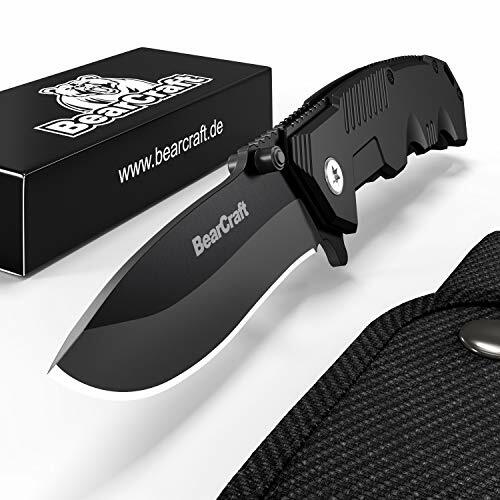 ✓ FOR OUTDOOR-PROFESSIONALS: Whether outdoor adventure, camping or rescue knife in the car ... with this Survival knife you are prepared for all adventures! I bought this knife as a starter knife for a teen. I gave it to her for her birthday and she loves it. Not a bad deal. I liked it! Made from very good material and can be folded easily. 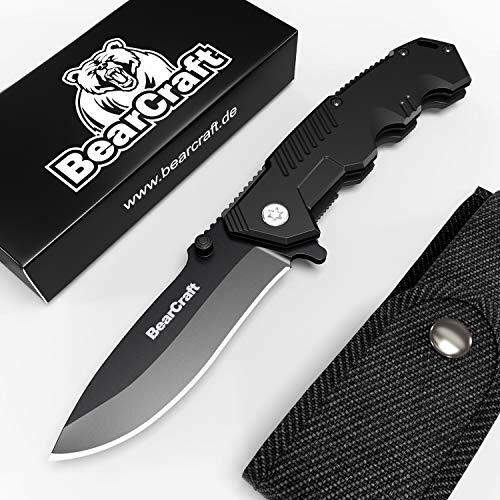 This knife is made with great materials. Really well made and sharp. Awesome knife! Im a huge user of pocket knives on a daily bases... This is on the top 5 list to have in your pocket or in your car! Super sturdy feel, was not a huge fan of the pouch that was provided.. however, the knife is the reason for the purchase not the pouch! thats just an extra... This knife comes VERY sharp from the start... Amazing buy. Nicer than I expected, this knife for the price point has a great build and feel to it. The quick action spring lever tab let’s you open the knife super fast with your index finger. The clip is perfect for me because I typically carry my knife in my front jean pocket. The carrying case it came with isn’t anything to get super excited about, but it is definitely functional and well made. I could see using it on my tool belt or vest. 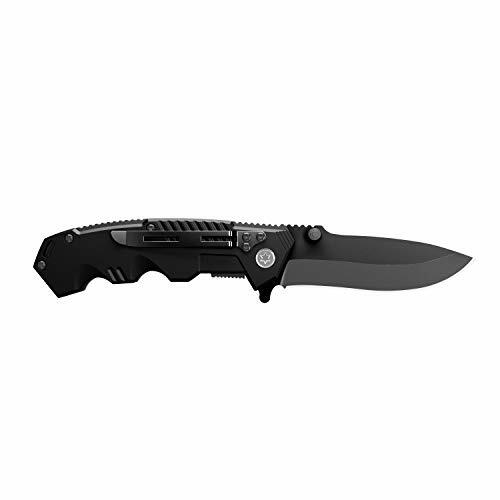 Good quality knife that is spring loaded so opening it is super quick and easy! i gave the knife to a coworker and you really likes it, from the looks of it the length of the blade is long enough and the design was superb for any beginner. 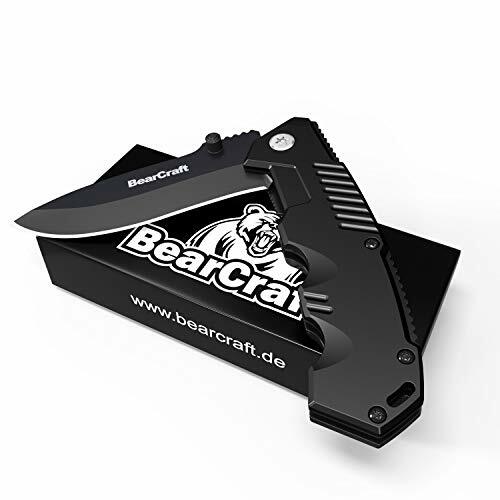 Not only is this knife sleek its easy to use and you can place it in your purse or rock it on a hunting trip. It was kind of stiff at first when you first open it but as you continue to use it, it will loosen up. This is a must have for anyone on a camping or hunting trip and for everyday wear when you running to the store. 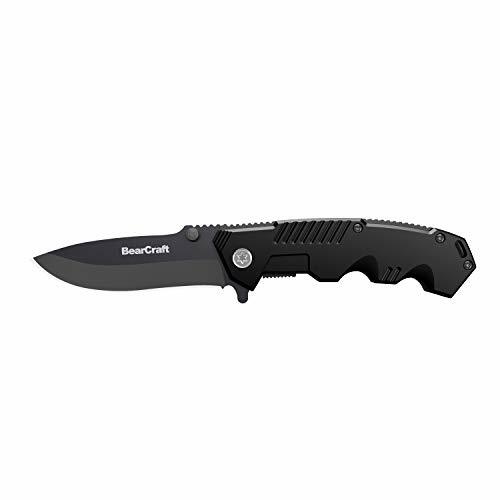 A nice basic pocket knife. I like this pocket knife quite a bit. It is well made and sharp. It can be quickly opened with a thumb flick. The belt clip is a good feature too. I really like this knife because it makes cutting boxes simple and easy. It cuts through tape, through boxes, through packing materials and makes it all look so easy. Now I'm sure there may be 100 other uses, but box cutting is the best one for me. Great knife for such a small price tag. Knife shipped quickly. Item arrived undamaged. The knife is pretty good quality for the price. It takes and holds a blade fairly well. It is a little stiff initially, but loosens up a bit after you work it. I like this knife. It lives in my girlfriend's purse and is perfect for that job. If I had one complaint, the ridges near the spring assist lever are sharp, not cut you sharp, but uncomfortable. I might knock the down with the sharpening stone but it is a minor issue. For the price, I am not complaining. I would reccomend this knife and buy this again. Looks sweet. Smooth operation. Nice cuts. Impressed. The knife is very sharp and secure. The safety it has so it doesn't close is different to what I have usually know. But it is very safe. This is a nice, black knife I use for work. It was a great grip and comfortable to hold. The blade is like any other, its sharp, once in a while you have to touch it up after extensive use. The knife tip is very durable, I've been stabbing and cutting things with the point and still has not damaged or broken off. Even penetrates sheet metal without problems. Good knife for the price. Very nice pocket knife, heavier in weight. Smooth opening operation (one handed), needs to be broken in some to be able to close easier. But all in all very happy with the pocket knife, nice size, heavy weight and smooth opening. Very sharp knife I keep it in my vehicle for emergencies. Comes nice and sharp from the factory. A little hard to open one handed, but probably just needs a little adjustment. Comes with a basic belt sheath.